Mercedes could have matched two pole records in Singapore, team and driver, but in the end they qualified fifth and sixth, some 1.5 seconds away from Sebastian Vettel’s pole. Vettel’s pole position was the first for Ferrari since the 2013 German GP and their first dry pole since the 2010 Singapore GP. Vettel won in dominant fashion and led every single lap, sounds familiar doesn’t it? Not only did Vettel lead every lap, but Ricciardo was second for the entire race and Raikkonen third for the entire race. Luckily the rest of the field had some overtaking, Max Verstappen started the race a lap down, was about 30 seconds down on the next car after 20 laps and then recovered to eighth position. Alexander Rossi has finally made his F1 debut and did a solid job of finishing ahead of his teammate and set a lap half a second quicker. 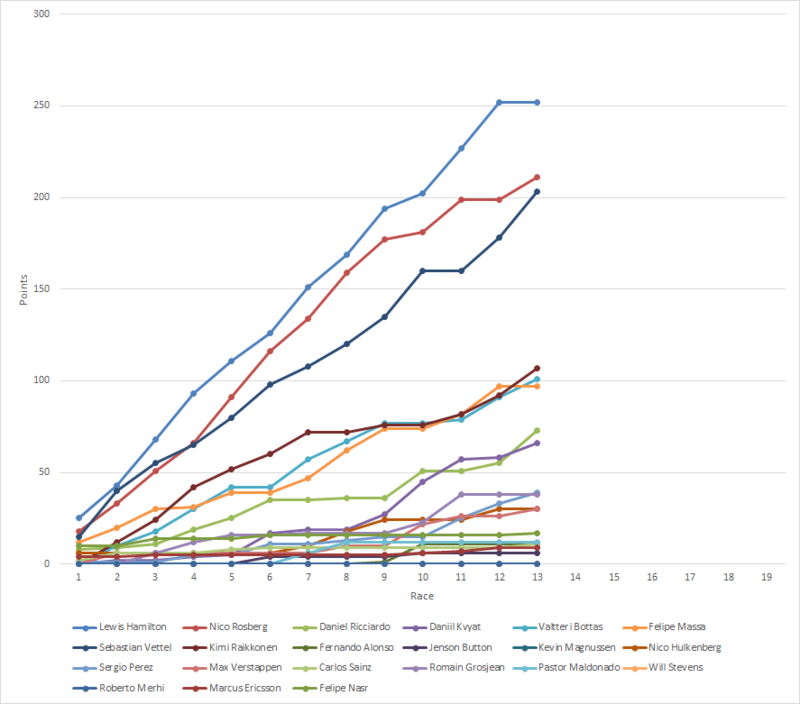 Five different drivers gained six positions from their grid position, Perez, Nasr, Ericsson, Maldonado and Rossi on his debut, partly helped by the five retirements. Vettel’s win was his 42nd in F1 and 75th podium, Ricciardo took his 10th podium and Raikkonen his 79th. 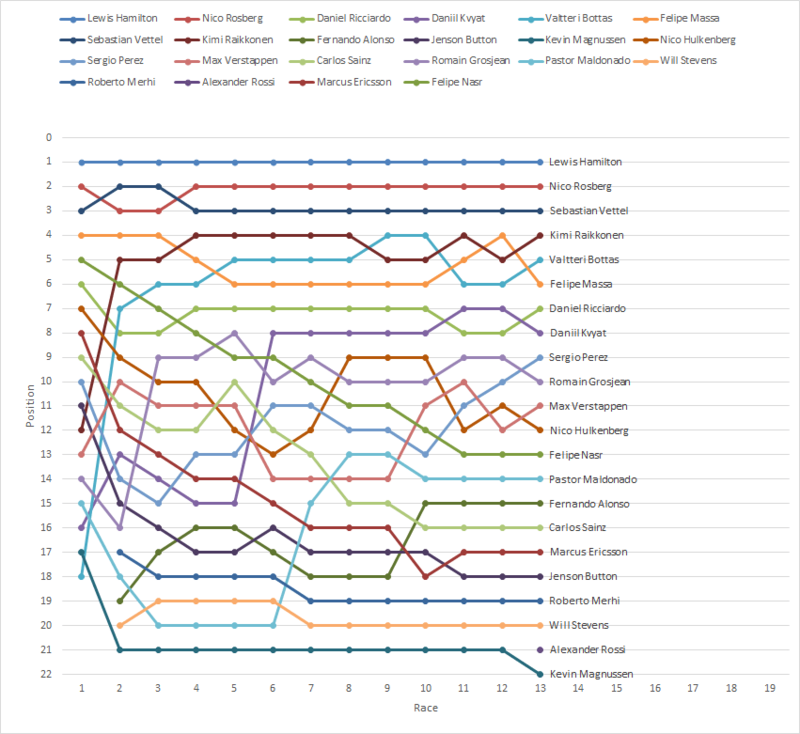 Quite a few changes in the championship this week, Raikkonen and Bottas have both moved up one position and Massa down two. Red Bull teammates Ricciardo and Kvyat have switched positions, as have Perez and Grosjean and Verstappen and Hulkenberg. Hamilton’s lead has been cut slightly to 41 points, even with a retirement Rosberg still doesn’t look like he can beat him to the title, but can Vettel?